Compact Crafting adds standalone, compact variants of the vanilla workbenches, featuring a new meshes and textures, and a new mini Power Armor Station, letting you set up everything you need in a small space! 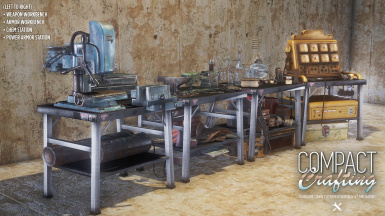 Wasteland Outpost - Tenpines Bluff blueprint Weapon and Armor benches are included in AWKCR but i also use others. Wasteland Retreat - Red Rocket Truck Stop blueprint Weapons and Armor included in AWKCR but i also use the others. FlaconOil for his wonderful Diagnostic Cart texture! Take back your space! 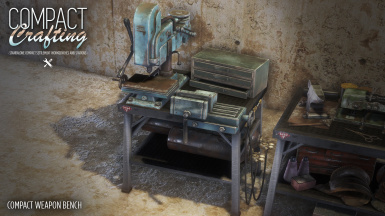 If you like to set up shop in small areas, you’ve noticed that the vanilla workbenches are pretty big. They look awesome, and I still love them, but being more of a basement dweller than I am a builder of mega-settlements, I like to keep things nice and small. 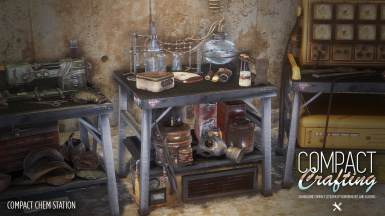 Compact Crafting adds standalone, compact variants of the vanilla workbenches, featuring a new folding table mesh and textures, with cut-up pieces from the vanilla benches added, letting you set up everything you need in a small space. Cooking stoves are already small enough that I didn’t include them here, but I may do so in an update. This also features an amazing retexture of the Diagnostic Cart from FlaconOil's HD ReTexture Project! I used part of the diagnostic cart in the PA Bench and wanted it looking tip-top. As a bonus, an “All-In-One” bench is included, which will behave as all benches, including stoves! It will also scrap junk! Simply craft it, activate it, and select what kind of crafting you’d like to do, and you’re off to making whatever you want, with space to spare. 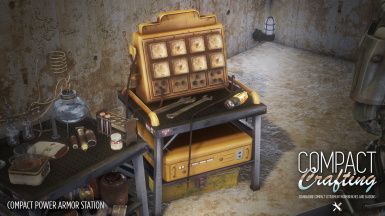 Benches included are: Armor Workbench, Chem Station, Power Armor Station, Weapon Workbench, and the All-In-One Bench. I even worked a little dash of lore in there, adding the H&H Tool Company logo on the new table. • Download, install and go! There are no requirements. There should be no conflicts, as everything is standalone. • This does NOT add new categories or edit vanilla categories in ANY way, everything is added under “Crafting” with the other vanilla benches. • All benches require the same perks to craft as their larger counterparts do, specifically Local Leader Rank 2. This was done to keep balance. 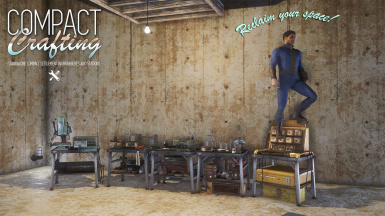 • MAKE SURE YOU LEAVE ENOUGH ROOM BEHIND THE POWER ARMOR STAND OR THE ANIMATIONS WON'T PLAY. If your character is just standing there when activating, pull the bench a little but further from the wall. 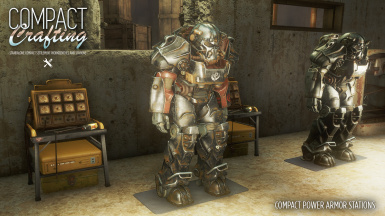 The vanilla compact power armor stations have this problem too, the only fix is to just make sure you have enough space for the player to get behind the PA during the animation. 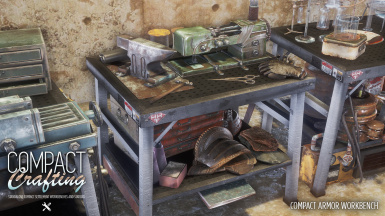 • The Chem and Armor Benches have variants with less clutter to not use up your settlement budget. They're right next to each other in the Workshop. • The animations don’t always line up perfectly because they were made for the big benches, but that’s blurred in the background while crafting anyway. • When moving the “All-In-One” bench, the game will take a few seconds to re-position the hidden components, so if when activating it you jump to the old spot with an invisible bench, just stop, wait a second and activate it again and it’ll be in the right place. • The Diagnostic Cart retexture is from FlaconOil’s HD ReTexture Project. Thanks to him for letting me include it here. Go get it, it's great! • Tools used: Blender, Outfit Studio, NifSkope, Adobe Photoshop, Intel Textureworks plug-in, NVidia DDS plug-in, Creation Kit, FO4Edit. IF YOU ARE USING A PIRATED/CRACKED VERSION OF THE GAME, THIS MOD WILL PROBABLY NOT WORK. PLEASE DO NOT ASK FOR SUPPORT! GO BUY THE GAME AND I’LL BE HAPPY TO HELP!